Valentine’s Day will be here in a matter of weeks and if you are looking for an easy menu to wow your sweet heart with, here it is! I’ve come together with one of my favorite food creator’s on YouTube, Vincenzo of Vincenzo’s Plate, to bring you two tasty options for the occasion. Vincenzo’s Ultimate Grilled Cheese Sandwich and my decadent Chocolate Hazelnut Tart. You can watch our video collaboration below! 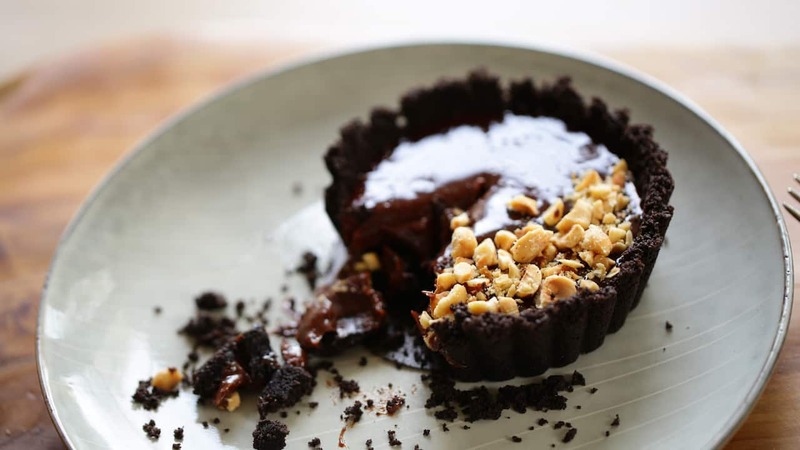 The best part about this Chocolate Hazelnut Tart is that it is super simple even for the novice cook! 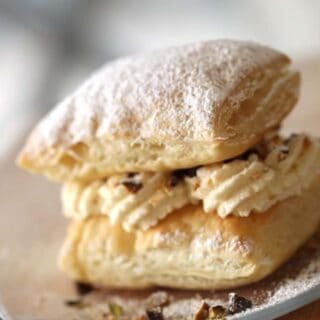 With just a few ingredients it comes together in a snap and can be made the day ahead! The secret to success is also the removable bottom tart pans! 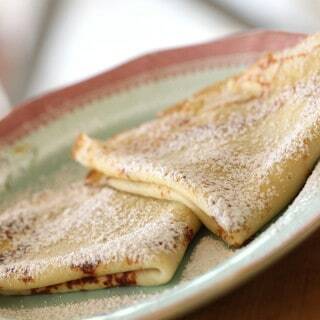 Non-stick, and plenty deep, they are seriously, the best! You can find them in my Baking Essentials Kit Here. 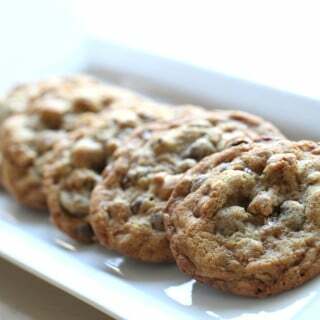 Crush cookie crumbs in a food processor (This link goes to Amazon where I am compensated for products sold) until smooth, add butter and pulse until combined. It should feel like wet sand, if too dry add more butter. Divide crumbs into 2 tart tins with removable bottoms. 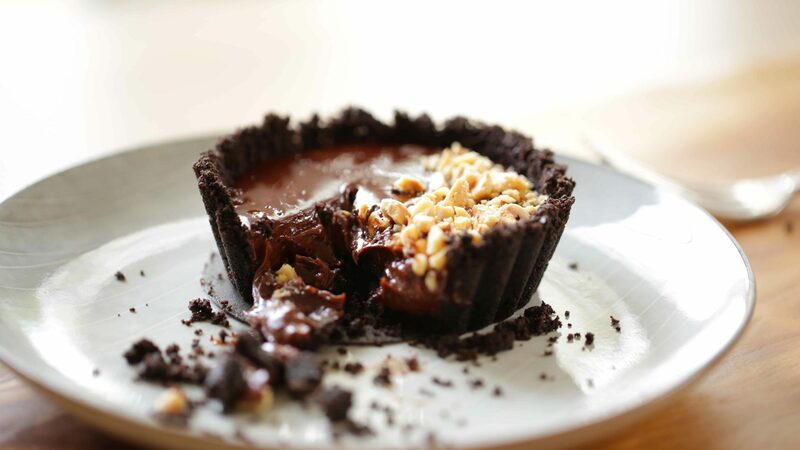 Using a metal measuring cup (or small glass) Press crumbs up the sides of the tin to create a crust. Press crumbs down at bottom too. And level off crumbs at top by pressing them down with measuring cup or your finger so that the top is flush with the tin. Place tins on cookie sheet and bake at 350F (176C) for 10 mins. Meanwhile place heavy cream in a large saucepan and warm until simmering and foamy, Turn off heat and add chips. Whisk until smooth. Add more cream in 1 tbsp (15 ml) increments if needed until chocolate is of pouring consistency. 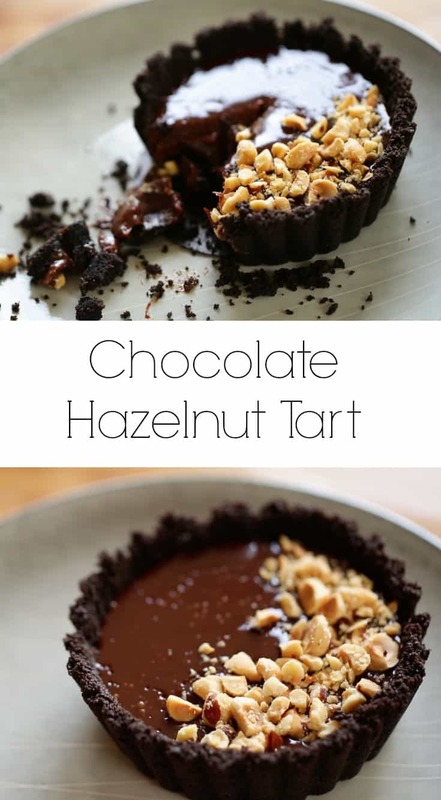 Pour chocolate into tins, top ½ half of tart (in a half-moon shape) with the chopped hazelnuts. Best way to chop a hazelnut? Place them in a plastic bag, and whack them with a rolling pin! 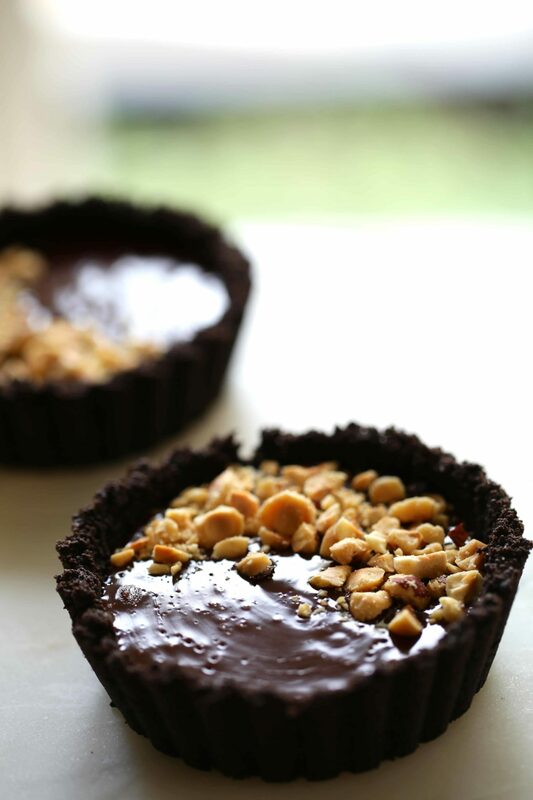 Refrigerate tarts for at least 1 hour for a gooey center 4 hours or overnight for a firmer fudge-like texture. 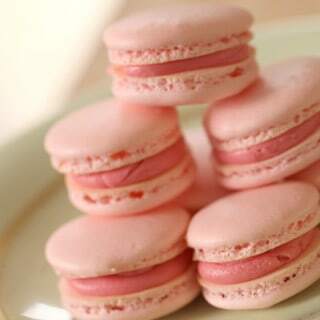 Before serving remove from tins and serve with lightly whipped homemade whip cream if you desire. Enjoy! 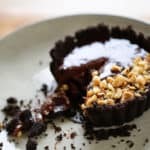 What size of tart pans are used in this recipe?